Joseph "Joe" Anthony Longo (7 October 1940 – 5 January 2014; age 73) was, as member of the art department, the property master on Star Trek II: The Wrath of Khan, Star Trek III: The Search for Spock, the first five seasons of Star Trek: The Next Generation and all seven seasons of Star Trek: Deep Space Nine. On The Next Generation he shared this occupation in a weekly rotation with Alan Sims. Longo was interviewed on 19 April 1993 about the props of the shows first season for the DS9 Season 1 DVD special feature "Alien Artifacts: Season One" (originally a segment from the 1993 documentary Star Trek: Deep Space Nine - Behind the Scenes). In 1996, Longo was interviewed by Syfy for the The Making of Star Trek Deep Space Nine Trials And Tribble-ations documentary. Born in Collinwood, Cleveland, Ohio to Charles and Charlene Longo, he graduated from the Van Nuys High School in 1958. Between 1962 and 1964 he served in the US Navy as aircraft carrier engineer apprentice aboard the USS Ticonderoga. 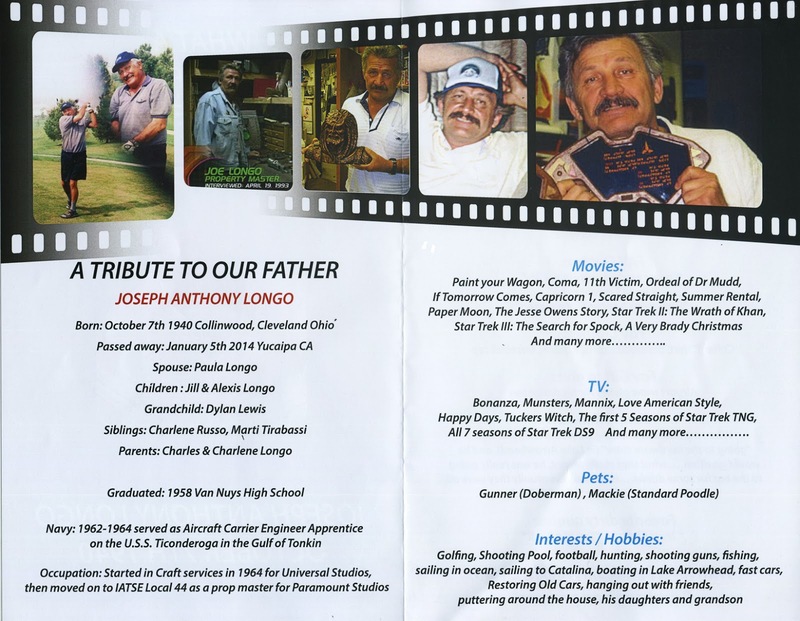 After leaving the Navy in 1964, Longo started working in craft service at Universal Studios and later moved to IATSE Local 44 as prop master for Paramount Pictures. Besides Star Trek, Longo was the property master on the television drama The Ordeal of Dr. Mudd (1980), the television series Tucker's Witch (1982, starring Catherine Hicks and Alfre Woodard), and the television mini series If Tomorrow Comes (1986). Prior to this he served as art department lead man on the science fiction thriller Capricorn One (1977). In 2000 he appeared in the television documentary Shooting War on which he also worked as consultant. Other projects he worked on include the drama Paint Your Wagon (1969), the comedy Paper Moon (1973), the science fiction film Coma (1978, starring Genevieve Bujold), the television drama The Jesse Owens Story (1984), the comedy Summer Rental (1985), and the television comedy A Very Brady Christmas (1988). Longo also worked on the television series Bonanza, The Munsters, Mannix, Love American Style, and Happy Days.